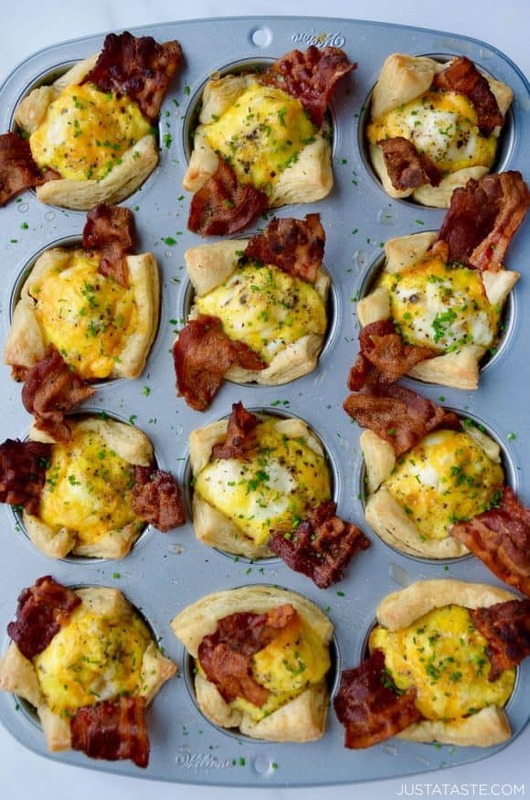 Skip the bagel and whip up the ultimate breakfast trio with a crowd-friendly recipe for Bacon, Egg and Cheese Toast Cups. It took living in New York City for a solid 6 years before I finally understood the allure of a good ol’ bacon, egg and cheese sandwich, or “B.E.C.” as the city folk say. The eggs can be cooked any which way—scrambled, over easy or over hard, although the latter is frowned upon, regardless if bacon and cheese are nearby to attempt to save the day. The traditional vessel for transporting the B.E.C. trifecta to one’s mouth is a bagel, which becomes a chewy sponge for sopping up all the gloriously runny yolk. Well, B.E.C. 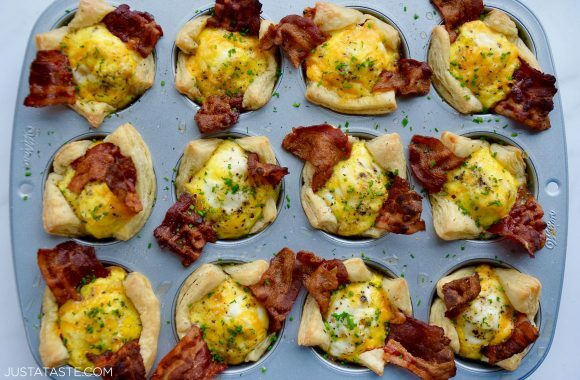 enthusiasts, I’m about to switch up your breakfast game by bypassing the bagels in favor of pillowy puff pastry cups. 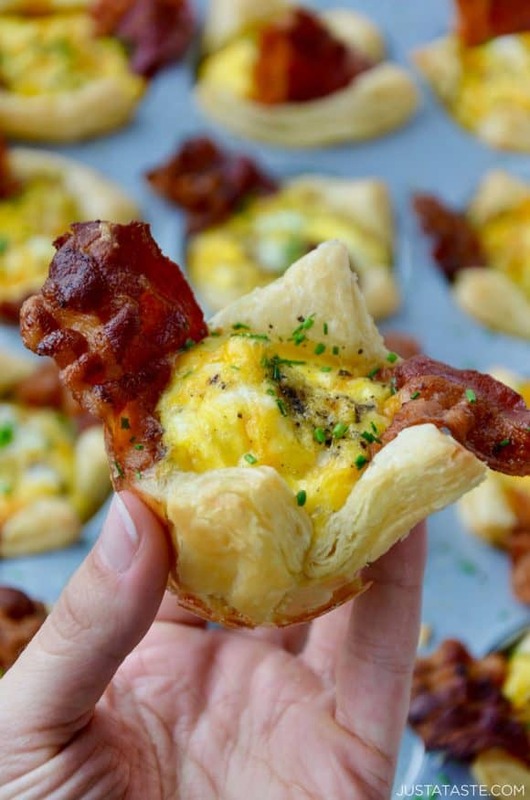 The perfect marriage of puff pastry and eggs is a fan favorite around here, but never have bacon and cheese been part of the equation. Perhaps the greatest win in the swap of bagels for puff pastry is that you can whip up an entire dozen of these toast cups in 45 minutes or less (30 of which are when they’re in the oven and you’re lounging couchside, mimosa in hand). Swap in your cheese of choice and don’t hesitate to herb it up with chopped fresh chives or scallions in your scrambled egg mixture, and perhaps a chopped veggie or two. Pop the muffin pan in the oven and B.E…see you later, hectic brunch routines! Toast cups are fast, crowd-friendly and perfect for busy mornings when cereal just won’t cut it. Divide the bacon slices between two large sauté pans set over medium-low heat and cook the bacon, draining the grease as needed, until it is almost fully cooked but still pliable enough to bend. Set the bacon aside. 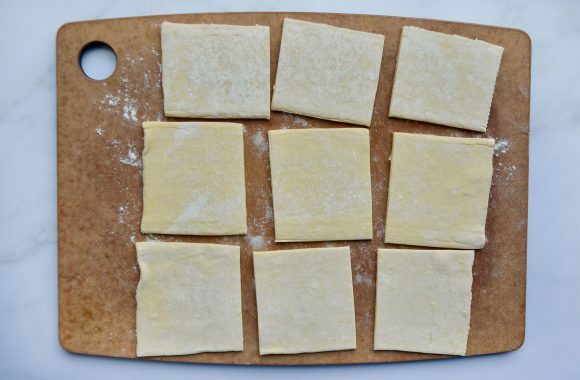 Lightly flour your work surface then unfold each of the puff pastry sheets onto your work surface. Using a rolling pin, roll each sheet to seal together any creases. 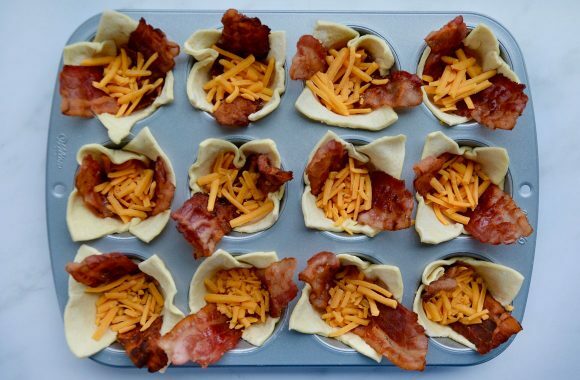 Place a strip of cooked bacon inside each cup so that the ends stick out of the cups. In a large bowl, whisk together the eggs with the milk and a pinch of salt and pepper. 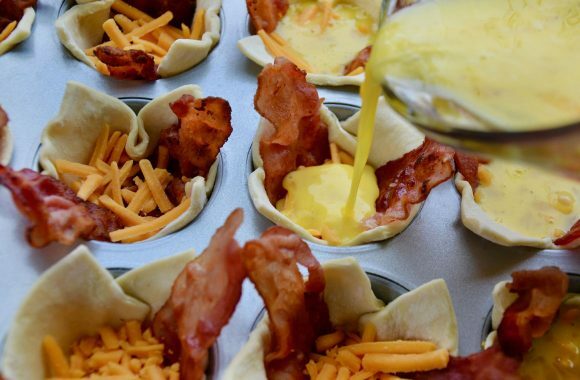 Divide the cheese among the muffin tin cups then ladle the egg mixture into each muffin tin cup. Bake the eggs for 18 to 22 minutes until the puff pastry is golden brown and the eggs are cooked through. Remove the egg cups from the oven and let them cool for 5 minutes before using a knife to loosen them around the edges. Sprinkle the egg cups with the chopped chives and serve immediately. Next Post: Carl’s Jr.’s 420 Burger Won’t Make You High Enough to Eat Carl’s Jr.